Dramatic, fantastical, otherworldly — this is the end of the world, for real. Positioned at the southernmost tip of Argentina, this memorable port town is cradled between the pristine — and towering — Martial Mountains and accessed by the picturesque Beagle Channel (which was named for Darwin’s famed vessel). 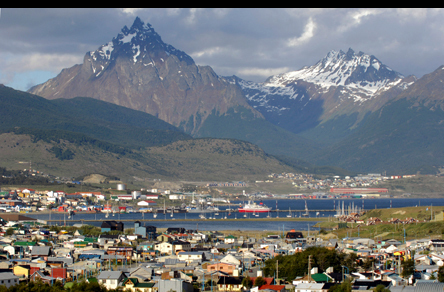 Ushuaia is the capital of the Tierra del Fuego region, which is best described as a spectacular collection of superlative natural wonders. It’s a veritable kaleidoscope of glittering glaciers, snowcapped mountains, dense forests, sparkling lakes and windswept plains spread across an archipelago of rugged islands. The town itself is a maze of streets lined with low-slung buildings that all seem to meet at its heart, the port. Founded in 1884, the far-flung spot welcomed missionaries, gold prospectors and naval officers before becoming known primarily as a penal colony. After its closure under the infamous Argentine leader Juan Perón, the large jail was reconfigured to house one of the city’s most popular museums. Other current in-town attractions include a maritime museum and a museum dedicated to the region’s natural history, as well as restaurants preparing the marquee offering — local king crab.